Saturday was "Make a Difference Day" and members of the WKYC staff were celebrating by volunteering all day throughout the communities in Northeast Ohio. From the Boys and Girls Club to the Lutheran Metropolitan Ministry’s Men's Shelter, we're all trying to do our part to make a difference in people's lives. You can still volunteer for Saturday's 'Make A Difference Day' around NE Ohio. You can also stop by Crocker Park and Legacy Village 11 .m. to 2 p.m. Saturday and meet WKYC volunteers and learn about signing up for Lifebanc. If you could choose to save someone’s life, you would do it. With one simple choice, you can save 8 lives. If you are still looking for a volunteer opportunity, Cleveland’s City Mission has come up with a very creative one – a “Trunk or Treat” event for the children who are staying at its Laura’s Home family shelter. Oct. 28 is "Make A Difference Day," a national day of community service organized by WKYC’s parent company, TEGNA, and TEGNA employees will be donating their time at a variety of local charities. On Make a Difference Day, Oct. 28, the Foodbank will be one of more than a dozen Northeast Ohio nonprofits that will be welcoming local volunteers to help them serve the community. NE Ohio non-profits; do you need volunteer help? 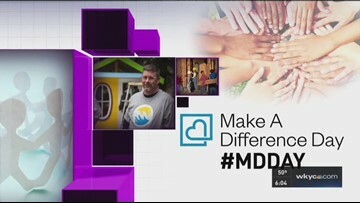 You still have time to add a volunteer project to the list of options for Make a Difference Day, a national day of service that encourages everyone to spend a few hours giving back. WKYC employees were among the 1500 volunteers that worked around Northeast Ohio today for Make a Difference Day. Local residents and community members volunteered for Make a Difference Day. WKYC and Tegna stations across the country participated in Make a Difference Day. Northeast Ohio will come alive with volunteerism on Saturday when more than 1,500 people show up for community service projects, as part of Make a Difference Day. Cleveland State University students have participated in Make a Difference Day for more than a decade, and nearly 100 are expected to volunteer this year. On Make a Difference Day, volunteers will fan out across the region to participate in a variety of outdoor clean-ups. Students at Kirtland Elementary and Middle School have organized a school supply drive in order to support the Cleveland Kids in Need Resource Center.